So I start a new job tomorrow and frankly, I'm bricking it. I'm returning to the world of traditional retail, albeit in an expanded role. I'm excited but nervously so. One of the biggest challenges (for me anyway) is returning to a semi-formal work wardrobe. I've been relatively lucky in my career over the past few years to be in non-facing roles, so there have been no firm rules regarding work attire. I'd never rock up to work in tracksuit bottoms, but jeans, casual shirts and boots formed my usual outfits. Stepping back onto the shop floor meant I had to confront one of my biggest hates; trying on trousers. I am a man of odd proportions, especially in trouser fittings. I have sizeable calves and thighs but no bum - I often have to go up a waist size to fit my legs and then you get that unflattering pouchy crotch when you tighten your belt. Also, I'm a short-arse so most trousers have to be altered too. Anyway, I steered clear of most of the high street stores such as Topman, River Island and H&M as I knew there was no chance I'd find anything to fit. I decided to check out Matalan on a whim (and partially as I don't have a huge budget to build a new work wardrobe at present) and was pleasantly surprised with their fittings. I picked up 2 pairs of trousers under £20 each with the mindset that they can be replaced without going broke. I went for classic navy and a grey herringbone. I thought these would be the most versatile colours to pair with shirts. I think sticking to the tried and tested colour combinations are always going to serve you well when dressing for a new occasion. There will be plenty of time later to inject some more character or experiment with colours etc once you've established the correct dress code. I personally never wear black trousers, I just don't find them flattering on me and think they are actually harder to co-ordinate than navy or grey. It's just too harsh so I leave black for funerals. My avoidance of black also applies to shoes. I know this is controversial to many dapper folk and flies in the face of tradition, but I just hate to look down and see black shoes. I opt for tan or brown, both of these work really well with greys and navy. I pulled a quick edit of my planned first day outfit. I went for the navy trousers and paired them with a relatively broad blue pin-stripe shirt from Primark. The inside of the collar and cuff is contrasted with lilac pinstripe. I'm pairing this with a new burgundy wool flannel tie I was recently sent by TM Lewin, The colour is masculine and strong without being too bold. It's pretty versatile too and will work with sharp white shirts or shades of blue. I also like the contrasting texture, it makes a change from the usual silk sheen. Never wear a branded logo belt in a professional setting. Please. I've also chucked in my (well worn) tan Mulberry wallet and my tortoiseshell glasses. If I can't act intelligent, I can at least look it, right? TM Lewin also kindly sent me a gorgeous pocket square. While in subtle grey, the bold geometric pattern is eyecatching. I'd suggest wearing it in a navy suit to make the most of the colour and pattern. As soon as I hit the publish button, I'm off to iron my shirt, tidy up my beard and get an early-ish night. Wish me luck! Are you an office maverick and push the boundaries of professional attire or more of a conservative connoisseur, dressing for work not for fun? I hope to feature a few more workwear outfits in the coming months as I embrace my new role. Watch this space! Minding my own business yesterday evening, listening to the lashing rain outside (can we officially declare summer's TOD now?) when an exciting email popped into my inbox. 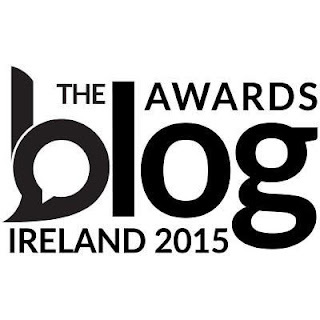 I've been long-listed for The Blog Awards Ireland in the Best Fashion Blog category. I am humbled, astonished, proud, elated and anxious in equal measures. This is the preliminary round, the long list will be condensed on 7th September with the short list announced then. As cliched as it sounds, it really is an honour to be nominated and even more so in a category that is so heavily female dominated. I was happy to see David from Dapper Dave Cash and Adam from Comme Des Voguedown listed alongside me, nice to see some fellas representin'! I'll keep you updated should I be lucky enough to move on to the next round, but in the mean time, check out the list of blogs here. A wee shout out to my blogging missus Ruth of Willow Lane who has been nominated in the Best Lifestyle Blog category for the second year running. Well done my dear! Time waits for no man. Using your time effectively and working to deadlines are part and parcel of the modern lifestyle. I'm a pretty laid back guy, I don't tend to let things bother me that much but there are situations we must all face that engages our fight or flight instincts. TAG Heuer has a long standing history with the world of sports where time and stress are what makes the difference between winning and losing. Their current hashtag slogan is #DontCrackUnderPressure and I don't think there's a more apt mantra for today's man. With this in mind, TAG Heuer and Goldsmiths have asked me to share an exciting competition with my readers. In a true test of reflexes, can you beat the clock? Simply (he says slyly) hit the buttons on the screen as they light up and you could win a Goldsmiths voucher worth £150.00! Time and pressure create diamonds, wouldn't you rather be a diamond than coal? The days are getting shorter, the air is getting crisper; this can only mean one thing - autumn is almost upon us. While the festivals of summer are usually where a hip flask comes into play, I prefer the romantic notion of a long walk in the woods on a crisp day with a packed lunch and a flask to keep the cold away. With cheap, novelty flask found in several high street stores, I want a flask that has special something. I don't want something emblazoned with a tacky slogan or encased in pleather trying to be "rural rustic". I want a flask that is understated but stylish, that catches the eye with intrigue rather than audacity. I chose the SWIG Harris Tweed Flask as it fits all my criteria. The flask itself is minimal and sleek should I chose to use it au naturale or clothed in its official Harris Tweed finery, it's a piece any style-conscious countryman would be proud to carry. 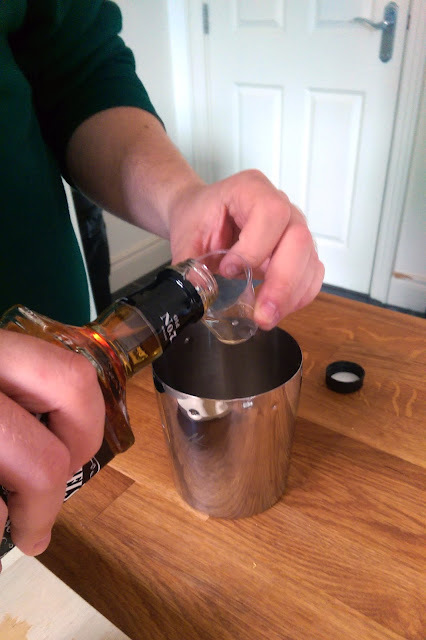 The flask would make an ideal gift for any man, so you're pretty much sorted for any birthday, Christmas, Father's Day, anniversary or spontaneous event. I believe any man's gift should be practical at its core; most men don't have the time for novelty. If it serves a purpose in a stylish or interesting way, you are pretty much guaranteed to have a happy recipient. SWIG offer an engraving service too so you can personalise your gift with a special inscription. Here's your chance to have a bit of fun, a private joke will go down better than HAPPY BIRTHDAY. Each flask also has a unique serial code, register it at SWIG's site and join the SWIG society for news, competitions and exclusive member benefits. You can also purchase additional sleeves, great for impromptu follow up gifts or just for a bit of a change. I have a number of seasonal blazers crying out for their inner pocket to hold this flask so I'm impatiently awaiting the arrival of my favourite season. I'm officially over summer, I've some serious autumning to be getting on with! relating to an early stage in evolutionary development; primeval. "the sea is the primal source of all living things on earth"
most important; primary or fundamental. "rivers were the primal highways of life"
"they ignore their primal masculine instincts"
To become a primal man, one has to re-establish the essentials in grooming. This is the core philosophy behind the Primal Man Shave Club, a monthly subscription service delivering only the finest in shaving and grooming supplies to discerning men. 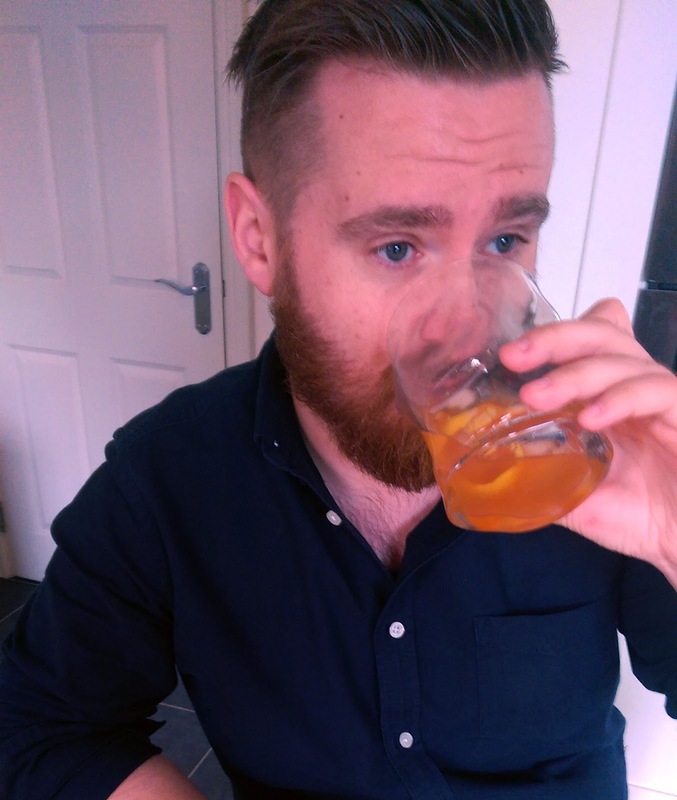 Primal Man Shave Club recently got in touch and asked me to trial their products. Each month, a varied selection of shaving oils, soaps, balms and blades will be sent, saving you time and effort. As I've said before, I'm a reluctant groomer and as a stalwart beard wearer I was a little dubious how useful a service such as this would be to me. However, the subscription can be cancelled or skipped as needed so if you have all the equipment you need to last you a few more weeks, suspend your next order and pick up when you want. While I have a beard, I do still pick up a razor on a semi-regular basis to tidy up the edges. By wet shaving around your throat (stop at the Adam's apple to prevent it looking too sculpted) and along your cheeks, it keeps your beard that bit more refined and professional. Your first delivery will include a premium Primal Man double edge razor - this is a revolution. The simplicity of a single blade and with a substantial weight means the razor does the work for you. It reduces the need to shave over the same spot again, helping to eliminate irritation or cuts. You'll also receive a shaving brush and soap, the only true way to enjoy a real close shave. By lathering up with a traditional badger brush and shaving soap, you not only soften your beard bristles, but it helps condition your skin too. Following deliveries will include varying soaps, brushes, creams and additional extras such as these handy alum matches, the barber's secret weapon when it comes to nicks and cuts. A quick dab with these will help stop any bleeding and save your collars! A month-to-month subscription costs £24.95, a reasonable expenditure to keep looking good. Should you decide to commit to a quarterly, bi-annual or annual subscription, you save even more money. The traditional barbering techniques have never been more popular but if you don't have the time to visit your local, save time and money and have your barber delivered to your door. This is a bit of a break from the norm of reviews or features. I love my blog, I really do - it's been something I've actually managed to stick to for over 2 years. If you knew how contrary and flaky I am in real life, you'd understand. In writing my blog, I've experienced such a mix of emotions. (I'm a big believer in bottling that mess up, never let them see you sweat.) But I thought I would try and show my fellow bloggers and readers, both new and old, the highs and lows you can experience when you live your life via a screen. This is easy, I am proud to have something that I started from scratch and that has been quite well received. However, pride can also be a negative; I don't take criticism of my blog well at all. Spelling or grammar mistakes, how I look on photos; all of this is something I try very hard to avoid so when it happens, its not pleasant. I like to tell myself I don't get angry but occasionally the flame burns a little hotter and I hate everything about blogging. My biggest bugbear are people who claim to be bloggers but don't put the work in. A Facebook page is not a blog. If you write in single paragraph posts and chuck up rubbish photos, you're making the rest of us look bad. The greedy craving of things and money. I'm guilty of this, I'll get sent a PR sample and then procrastinate putting the post up. But the product is mine now - I don't want to share!! This is unfair on the company and just makes me look bad. Laziness, apathy or indifference. This can be linked to my anger and my envy. Sometimes I just think "Frig it, let someone else do it." But then I remember that wasn't why I started. I started with the intent of showing that if someone of my height, my age, my build can enjoy fashion, anyone can. Again, its my voice so nobody else will be able to do it. Perhaps a bit abstract, but I think this connects to avarice and lusting after things you've seen; needs and wants of things you don't actually require. However, this is the nature of the fashion industry;we never need that many pairs of shoes, or that new shirt, or another pair of jeans. But we are expected and coerced to spending and amassing these things. Although mostly associated with food, classically gluttony meant overindulgence to the point of waste; usually at the expense of another. A parallel to avarice, bloggers can be gluttons, constantly looking for the next thing to write about, to photograph, to be seen in. This need for sharing and exposure can come at a cost in our personal lives as we can often neglect the special things we have around us. Thank you for indulging this little tangent, how many of these cardinal sins can you see in your own blogging life? Let's face it, the summer is pretty much over in Northern Ireland. As the evenings get darker and cooler, thoughts turn to comfort and warmth and that often means a little night cap. 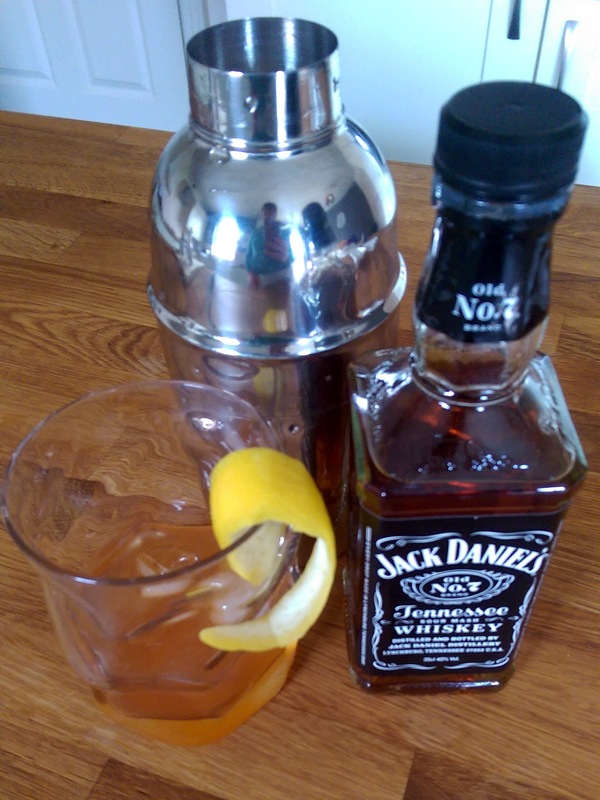 Jack Daniels sent me the recipe for the perfect whiskey sour and I thought I would give it a little try. When I drink spirits, its usually vodka or gin; cool, refreshing drinks. However, I've often said I would like to find warm, cosy drink and I think I've found it! 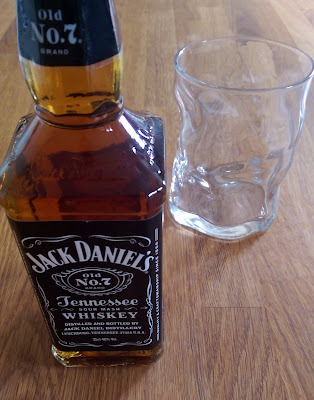 Start with 50ml of Jack Daniels No.7 Sour...that's 2 shots to you and me. 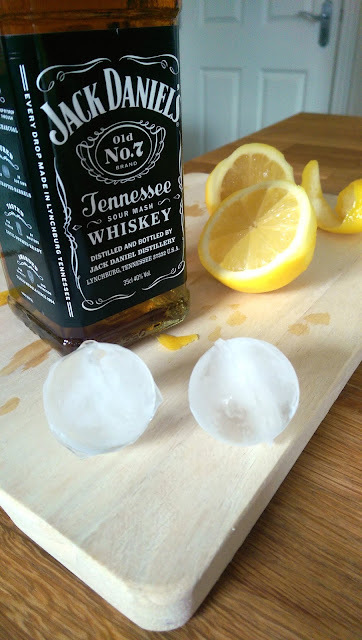 The Jack Daniels Sour is served in a traditional short glass, with cubed ice (or spherical if you're pretentious like me). 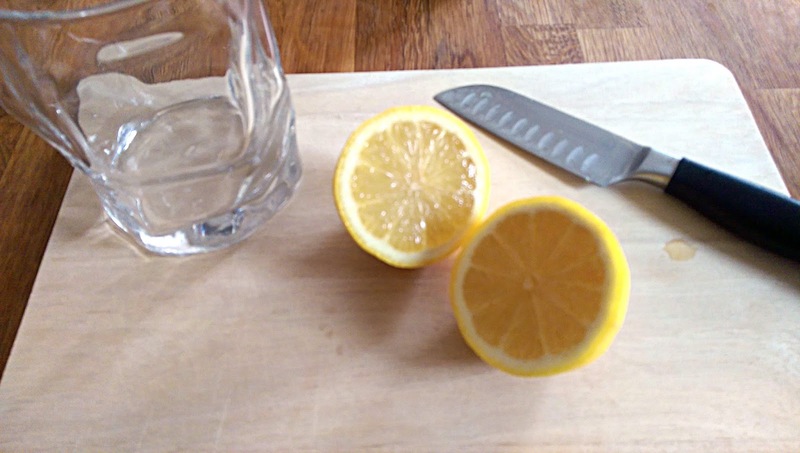 The glass is garnished with a lemon twist; just run a vegetable peeler over the lemon you juiced for the blend. 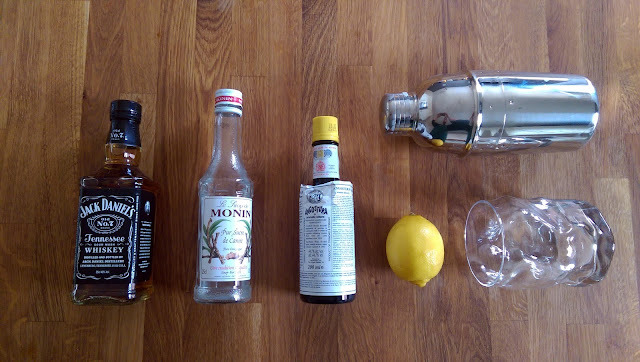 Classic whiskey cocktails like the sour and the Old Fashioned are having something of a renaissance lately, I think Mad Men is most likely the inspiration. So channel your inner Don Draper, mix yourself a Jack Daniels Sour and welcome in autumn! *Jack Daniels kindly provided me with a voucher for the supplies used.